You may remember from earlier posts, that when Kitten was a little kitten, Boyfriend and I thought it would be funny to put him in between some bread to make a Kitten Sandwich. Well last Saturday, Boyfriend and I were at the St. Lawrence Market; we saw a gigantic loaf of bread in the day-old section, and we knew what had to be done. We even decided that we would up the ante and add lettuce to this Kitten Sandwich. Things did not go as anticipated. 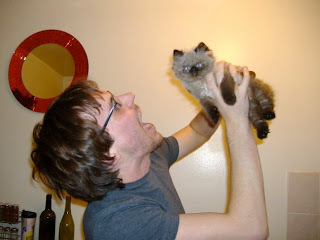 Our plan had been that Boyfriend would hold the bread and I delicately insert Kitten avec lettuce. Then I would snap a few infinitely adorable photos. Unfortunately, Boyfriend and I had not accounted for Kitten's massively increased strength. Kitten fought with all of his might to escape the Kitten Sandwich. In one of his classic fits of rage, Kitten broke free of the sandwich, severing the bottom of the loaf and splaying crumbs everywhere. I tried to convince Boyfriend that it would still work, but even I knew our shenanigans were up. 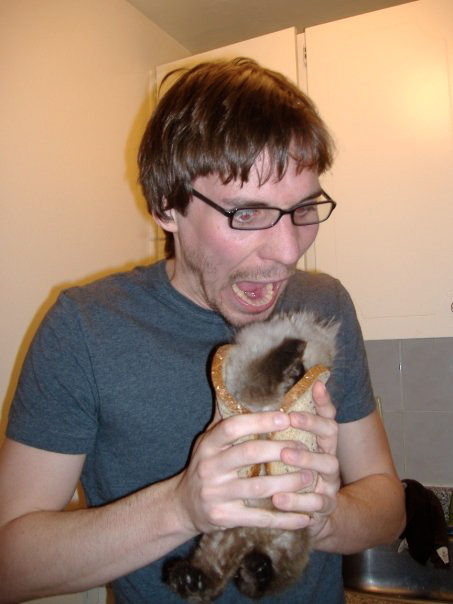 Though, my heart had been set on a Kitten Sandwich and never one to quit, I tried to see if putting lettuce on him would be equally as funny. It wasn't. All it did was further upset both me and Kitten. i tried this with my dog and she just ate the bread!